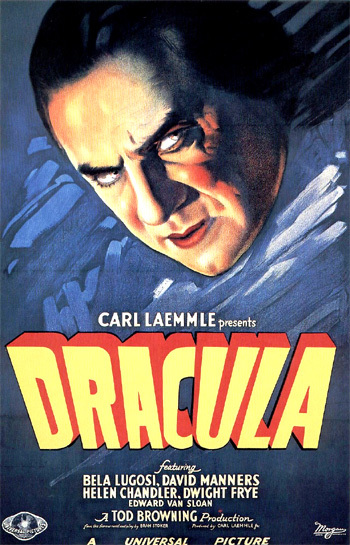 Dracula (1931) is one of the earliest classic American horror films from Carl Laemmle's Universal Pictures - an acclaimed masterpiece directed by Tod Browning, known also for two other vampire films: London After Midnight (1927) (aka The Hypnotist) with Lon Chaney, Sr., and his own sound-era remake, Mark of the Vampire (1935) (aka Vampires of Prague), with Bela Lugosi and Lionel Barrymore sharing Lon Chaney's dual role. On account of Universal's success with this classic Dracula film, the next year, Browning went on to direct the truly bizarre, classic horror film Freaks (1932) for MGM - a controversial and grotesque film that has achieved cult status, and was banned for almost thirty years in Britain. With this "talkie" horror film, Hungarian stage actor Bela Lugosi (originally named Bela Blasko), who had starred in the smash-hit Broadway stage play, took over the part for the film when Lon Chaney, Sr. ("The Man of a Thousand Faces") died of throat cancer. [Browning had teamed with Lon Chaney, Sr. on ten films, including The Unholy Three (1925) - about a trio of sideshow freaks, London After Midnight (1927), West of Zanzibar (1928), and Where East is East (1929).] Lugosi established himself as the definitive screen vampire. Since then, there have been about a dozen 'true' film adaptations of the Stoker novel, and literally hundreds of other Dracula sequels, farces, parodies, loose adaptations, and other vampirish variations (including the "blaxploitation" Blacula films of the early 70s). [The most frequently-portrayed character in horror films would eventually be Dracula.] It is generally thought that the BBC miniseries production (made as a 3-part television adaptation) Count Dracula (1977) with Louis Jourdan as the Count, is the most faithful to the original novel. Another reasonably faithful version is the Italian production of Dracula (2002) directed by Roger Young and starring Patrick Bergin, and disputably, Francis Ford Coppola's Bram Stoker's Dracula (1992). This successful, atmospheric 1931 adaptation, although somewhat flawed by its slow dialogue and static, stage-bound nature, helped to launch a long series of horror-pictures for the studio. (Universal's follow-up picture was the equally successful gothic Frankenstein (1931).) Its eerie lighting, gliding camera trackings, and moody and shadowy atmosphere were largely the work of cinematographer Karl Freund. [An impressive-looking Spanish version, with director George Melford in place of Browning, was shot simultaneously on the same sets at night, but with a different cast and crew (Carlos Villarías replaced Lugosi, and Eduardo Arozamena as Van Helsing, along with provocatively-dressed actresses Lupita Tovar as Eva (Mina) and Carmen Guerrero as Lucia (Lucy)).] Hammer Films generated The Horror of Dracula (1958) (with Christopher Lee as "the Count") after purchasing film rights from Universal. Although it's hard to believe today, segments of the film were censored in overseas viewings: a gigantic bug's emergence from a coffin, the appearance of Dracula's three zombie-like wives in his castle, Renfield's begging scene to allow him to eat spiders and flies, and the reading of a newspaper account of vampire bride Lucy's victimization of children. We must reach the inn before sundown!...It is Walpurgis Night, the night of evil Nosferatu! On this night, Madame, the doors, they are barred, and to the Virgin we pray. When the coach finally comes to a halt at an old inn, the darkness is impending - it is nearly dusk and the sun is going down behind the black mountains. Most of the relieved passengers climb down to end their journey for the day. Englishman: Well, I'm sorry, but there's a carriage meeting me at Borgo Pass at midnight. Englishman: Yes, that's where I'm going. Innkeeper: (tremulously) Nooo. You mustn't go there. We people of the mountains believe at the Castle there are vampires. Dracula and his wives - they take the form of wolves and bats. They leave their coffins at night and they feed on the blood of the living. The traveler, an affable real estate agent named Renfield (Dwight Frye) isn't superstitious or afraid of the warning: "But that's all superstition. Why I, I can't understand why..." He is interrupted by an announcement that the sun is setting, and the innkeeper insists: "Come, we must go indoors." The passenger demands to go further: "It's a matter of business with me. I've got to go. Really. Well, goodnight." As he climbs back into the coach, the innkeeper's peasant wife rushes over and places a crucifix around his neck, advising: "Wait. Please. If you must go, wear this for your mother's sake. It will protect you." The journey to Borgo Pass commences, as the fearful townspeople watch the coach depart. As it gets darker, the coach presses on through the black, jagged mountains. Dracula's Castle emerges into sight, and then the audience has its first eerie dark glimpse of Dracula's coffin in his dark, rat-infested, cob-webbed cellar. The coffin lid slowly creaks opens and a hand snakes its way out. A possum lurks next to another coffin. The slamming sound of Dracula's coffin lid signals that he has risen. One of his undead brides also slowly opens her coffin with her hand. A gigantic bug, that looks like a wingless bee, crawls out of another coffin. The undead bride emerges by sitting upright within her coffin. A possum descends into a skeleton-filled coffin. The first glimpse of Dracula, a 500 year old vampire, is shocking. He is standing upright next to his coffin, wrapped tightly in an all-enveloping black cape. His ashen face with a piercing, unmoving, cold fixed gaze is illuminated with an unholy glow from the twilight and his black hair is slickly combed straight back. Rats scurry about and wolves howl. Two of Dracula's three undead brides glide silently along. In the swirling fog around Borgo Pass, a coachman waits for the arrival of the dutiful English businessman on his important journey. Near midnight, the coach arrives. The terrified coach driver stops just long enough for his passenger to climb down at the bleak crossroads. The driver hurriedly throws his luggage on the ground and then abandons him. Sitting atop it, wrapped in a black cape, is a tall, silent figure staring straight ahead. The passenger nervously asks: "The coach from Count Dracula?" The mute coachman gestures for him to get in. On the way to Dracula's castle over jostling mountainous roads, he leans out the coach window to speak to the driver - but the coach is driverless. The coachman (Dracula himself) has disappeared - morphed into a large gray bat that flaps its wings above the horses and appears to be guiding the carriage instead as it hurtles through the night. However, he realizes there is only an empty seat - and no driver! The massive wooden and iron castle door mysteriously creaks opens on its own. Unsure of things, Renfield warily passes through the door and is amazed to find a huge, deserted and ruined chamber inside. In the dark cavernous room, there are round pillars framed by archways, massive windows, and a few sparse furnishings in the dim light. Bats soar outside the windows and there are other scurrying sounds inside, suggesting menace. The dwarfed figure of Renfield stands at the bottom of the wide and long stone staircase of the castle. An ominous silence hangs heavily in the air. Dracula, elegantly dressed in a black tuxedo, slowly descends the massive staircase while holding a single candle. Rats and armadillos scurry across the dirt-covered stone floor. A giant spider web hangs from the ceiling above the staircase. When Renfield turns, he is startled to find Dracula walking through the large spider web without disturbing it. I am...Drac-u-la...I bid you welcome. Listen to them. Children of the night. What mu-u-u-sic they make. The spider spinning his web for the unwary fly. The blood is the life, Mr. Renfield. Renfield is invited into his "more inviting" medieval-looking guest room upstairs, where Dracula is outwardly charming. There is a fire burning, a meal spread out on the table, and a dusty old bottle of wine. Dracula takes Renfield's coat and hat and leaves through a door that opens on its own. When the host returns, Renfield assures the Count that he has kept his journey a secret - no one in England knows he has come: "I followed your instructions im-plicitly." Renfield has been hired to arrange for Dracula's relocation to a neighborhood in England where he will lease a ruined and deserted English abbey named Carfax Abbey. Only the papers need to be signed to finalize the deal: "Everything is in order awaiting your signature." "I hope I've brought enough labels for your luggage," asks Renfield, anxious to please his client. Dracula describes his 'luggage' (of coffins): "I'm taking with me only three, uh, boxes." Dracula leaves his guest for the evening with: "Good night, Mr. Ren - field." Soon, Renfield feels light-headed and dizzy. Dracula's three undead wives silently appear from the fog and glide together into the room. To get fresh air, Renfield stumbles to the terrace window and opens the door to the balcony, where he notices a large bat flying above him. Renfield staggers and then collapses on the floor, drugged by the wine into a deathly slumber. The zombie-like spectral wives wolfishly move toward the body. The Count, skilled at metamorphosis, emerges where the bat had disappeared and enters from the balcony. With a silent sweeping gesture, he commands his wives to move off and they back up into the shadows. Dracula approaches and then crouches down at Renfield's neck for a meal of blood, enveloping him in his cloak. You will keep your promise when we get to London, won't you Master? You will see that I get lives, not human lives but small ones, with blood in them? I'll be loyal to you Master. I'll be loyal. When the ship finally drifts into an English harbor at Whitby, it is a ghost ship filled with corpses. Imaginatively staged, the voices of men investigating the ship are heard. They rove around the deck (the camera follows their wanderings) and find the entire crew on the derelict vessel dead: "The Captain dead, tied to the wheel. Horrible tragedy, a horrible tragedy." Only an enslaved, lunatic appears to have survived - they hear crazed laughter from the hold. Sole survivor a raving maniac. His craving to devour ants, flies, and other small living things to obtain their blood, puzzles scientists. At present he is under observation in Doctor Seward's Sanitarium near London. In Victorian London, his new place of residence, Dracula pursues human blood to satisfy his hunger. Well-dressed in an opera cape and top hat, he strides through the foggy London streets at night and cunningly preys on women. On his way to a performance of the London Symphony, his first victim in the fog-shrouded streets is a flower girl who offers: "A flower for your buttonhole, sir? Here's a nice one." With one look at his hypnotic stare, she is placed in a trance while he slowly bends down toward her neck. Police whistles sound as he walks away from his first murder victim. One night, during a performance of the London Symphony at the Opera House, an elegantly-dressed Dracula hypnotizes a female usher/hostess and commands her to interrupt Dr. Seward (Herbert Bunston) in his box, telling him that he is wanted on the telephone. Pretending to have overheard the name of Seward as he is called away to the phone, Dracula stages the opportunity to introduce himself as Count Dracula - the new neighbor in the leased Carfax Abbey conveniently located next to Seward's sanitarium. Dr. Seward introduces his daughter Mina Seward (Helen Chandler), her friend Lucy Weston (Frances Dade), and Mina's fiancee John Harker (David Manners). The abbey is known for being dark and gloomy, needing extensive renovation and repair, but Dracula is comfortable in its familiar surroundings: "I shall do very little repair. It reminds me of the broken battlements of my own castle, Transylvania." Lofty timbers, the walls around are bare, echoing to our laughter as though the dead were there...Quaff a cup to the dead already, hooray for the next to die! To die, to be really dead - that must be glorious...There are far worse things - awaiting man - than death.